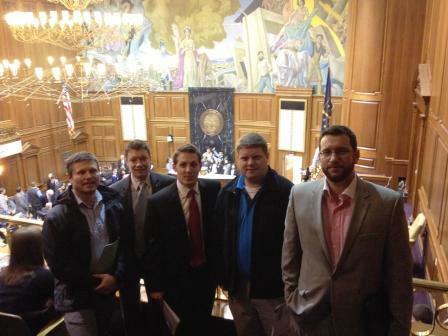 A small group of us had a great time at the statehouse this year. We got a chance to take in the beauty of the structure along with all of the craziness that happens within. In the end all of us were able to speak with our legislators from both the House and the Senate. Unfortunately several of the AIA supported bills had already fallen to the wayside, but we were still able to express our wholehearted support for both the Good Samaritan Bill and the Transit Bill. View Jason Shelley’s latest Legislative Newsletter here. Also follow the transit movement at @indyconnectnow and @indyconnect, a full fledged transit system would do absolutely amazing things for this city and the surrounding area. We make sure to do this event every year, hope to see even more YAF lobbyist out there next year! It is time again for the annual YAF Day at the Statehouse! This event is a great opportunity to see how things actually happen in government, while offering us a chance to learn about the issues that are affecting the profession. Jason Shelley, the Executive Director of the AIA, will be hosting us for lunch (free Jimmy John’s) at his office before we head over to the statehouse. He is more or less all-knowing when it comes to Architects and the Indiana Legislature. If you’re interested in learning more about the current legislative issues, review Jason’s most recent newsletter. Also, be sure to look over the AIA position briefs. If you’re interested in attending, please send an email to yafindy@gmail.com and let us know your home address, Jason will be helping in advance by tracking down who our legislators are.